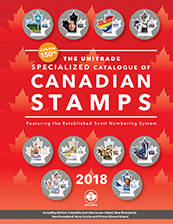 I am the editor of the Unitrade Specialized Catalogue of Canadian Stamps. The 2018 edition was sent to the printer in August 2017 and began shipping around October 27. I do not sell the catalogue. Please contact the publisher (Unitrade Associates) directly or your favourite stamp dealer. continue to have consistency throughout the listings (this will continue with future editions) and correct the annoying typographical errors (some of which have been around for many years!). We cannot guarantee that we have found all of them ... but we will correct any that are reported to us. 16 more pages were added to the catalogue (it is now 752 pages).